Did you know that you aren’t necessarily stuck with the high costs that air conditioning adds to your utility bill? There may be a few things that can be done to lower it. 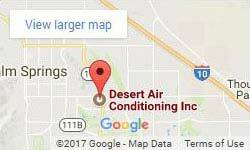 Calling Desert Air Conditioning Inc for an inspection with an air conditioning contractor in Cathedral City is the first step. You may be surprised at the number of ways we can help your current air conditioning unit run more efficiently, and possibly even suggest an upgrade. If he timing is right, we may have a promotion going on just the right air conditioning unit for your home or office. Your air conditioning contractor has many aspects of your air conditioning to review. From finding calibrating the thermostat to cleaning vents and checking for leaks in the ducts, all of these contribute to the efficiency of your air conditioning and the level of effort your cooling or heating system needs to use to work properly. The best way to ensure you are getting the most from your air conditioning system is to schedule regular air conditioning maintenance. Keeping your system clean, free of dust and debris, and all the parts and seals intact, will not only keep it working at its best, it will also extend the life of your system. In addition to the upkeep of your current system, your Desert Air Conditioning contractor can also make suggestions about your system. If you have an HVAC system that is getting old and outdated, chances are good that you could save a lot more on your utility bills with an upgrade. Depending on the size of your home or business, our air conditioning contractor can offer advice on what is the best air conditioning unit for you. From selecting a manufacturer to discussing size and output, our contractor can answer any questions and help you find a system that fits your budget. At Desert Air Conditioning, our contractor will never pressure you. We offer information, answer questions, and let you make the decision that is right for you. If you do decide to upgrade, our air conditioning contractor and technicians are also prepared to handle the installation for you. As a locally-owned and operated business in the Coachella Valley since 1954, we offer quality in everything we do. We take pride in our work and hope to foster a lifetime relationship with all our customers. Contact a Desert Air Conditioning contractor today to get your air conditioning or heating system working at its best! Cathedral City, California is a lively desert city between Palm Springs and Rancho Mirage. Cathedral City has the second largest population in the Coachella Valley. With plenty of annual festivals and regular events, Cathedral City is the perfect getaway. With no shortage of places to stay, outdoor pools, and local eateries, people go to Cathedral City, CA for fun in the sun.